(Last Updated : 16.04.19). Check latest Delhi SSSB TGT Result 2019 - TGT English, TGT Computer Science, TGT (Drawing, Physical Education & Domestic Science Teacher), TGT SST, TGT Maths, TGT Hindi, TGT Science, TGT Home Science, TGT Natural Science, TGT Music etc. Delhi Subordinate Service Selection Board (DSSSB) declared written result of TGT Urdu, TGT Sanskrit, TGT English, TGT Social Science, TGT Natural Science, TGT Maths & Hindi. The board conducted written examination in 2018 for various posts of TGT under Advt. No. 04/2017. 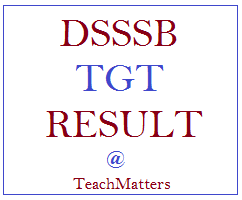 See here latest DSSSB TGT Result 2019. Check TGT Selection List, Cut-off Marks, Counselling Schedule. Here is latest result of TGT TIER 1 Exam 2018 held for Advt. No. 4/2017. DSSSB has released result marks list of TGT English exam held in September 2018. Here is latest result of TGT TIER 1 Exam 2017 held for Advt. No. 2/2014 for TGT Drawing (193/14 & 208/14), Domestic Science Teacher (209/14) & Physical Education Teacher post code - 210/14. TGT TIER One Exam 2017 was held on 30.04.2017. The Board on 11.06.2018 declared Revised Result Notice 257 for the post of Music Teacher (207/14). The final result of Drawing Teacher (208/14), Domestic Science Teacher post code 209/14, Physical Education Teacher (210/14) was declared on 10, 09 & 08 Nov. 2017. The Official answer key was released on 16.05.2017. The Written test result was declared on 28.07.2017 by DSSSB. Here is the detail. Here is latest result of TGT Advt. No. 1/2014 for TGT Computer Science post code - 192/14. TGT Computer Science written exam was held on 21.05.2017. Official answer key was released on 08.06.2017. The Written test result was declared on 14.07.2017 as per the tentative schedule uploaded by DSSSB. Final result was declared on 12.09.2017. Additional Result for all categories was declared latest on 02.08.2018. Check here result and selection list for the post of TGT Computer Science. Here is latest result of TGT Advt. No. 1/2010 for various post codes - 09/10 & 10/10 etc. Here is latest result of TGT Advt. No. 2/2010 for various post codes - 51/10, 52/10, 53/10, 54/10, 55/10, 56/10, 57/10, 58/10, 59/10, 60/10, 61/10, 62/10 etc. Get here latest results of TGT One Tier Exam 28.12.2014 for various post codes and advt. nos. DSSSB TIER One Exam 2014 was held on 28.12.2014 and Written Test Result & Interview Result have been declared by the board for many TGT posts. Check here latest news/updates on DSSSB TGT Result 2017 Selection List, Cut-off Marks & Counselling Schedule. Tgt drawing teacher post code 208/2014 ki final selection list kab tak ayegi????? Please reply.